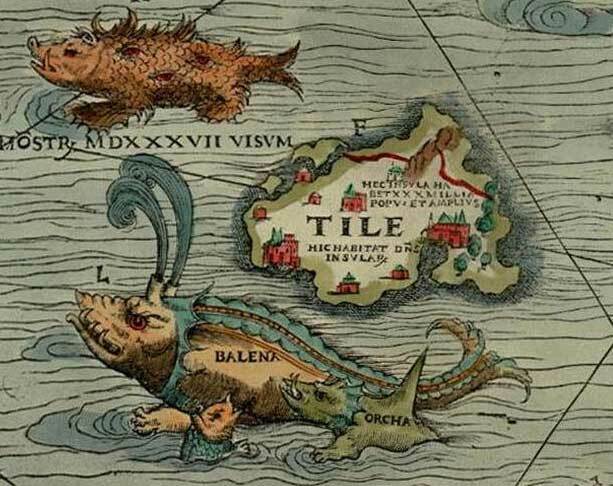 Thule, as Tile on the Carta Marina of 1539 by Olaus Magnus, where it is shown located to the north west of the Orkney islands, with a “monster, seen in 1537”, a whale (Balena), and a killer whale (Orcha) nearby. No earlier maps are available. Thule is, in classical European literature and maps, a region in the far north. Though often considered to be an island in antiquity, modern interpretations of what was meant by Thule often identify it as Norway, an identification supported by modern calculations. Other interpretations include Orkney, Shetland, and Scandinavia (Norway and Sweden). In the Late Middle Ages and Renaissance, Thule was often identified as Iceland or Greenland. The term ultima Thule in medieval geographies denotes any distant place located beyond the “borders of the known world”. The Greek explorer Pytheas is the first to have written of Thule, doing so in his now lost work, On the Ocean, after his travels between 330 BC and 320 BC. He supposedly was sent out by the Greek city of Massalia to see where their trade-goods were coming from. The 1st century BC Greek astronomer Geminus of Rhodes claimed that the name Thule went back to an archaic word for the polar night phenomenon – “the place where the sun goes to rest”. 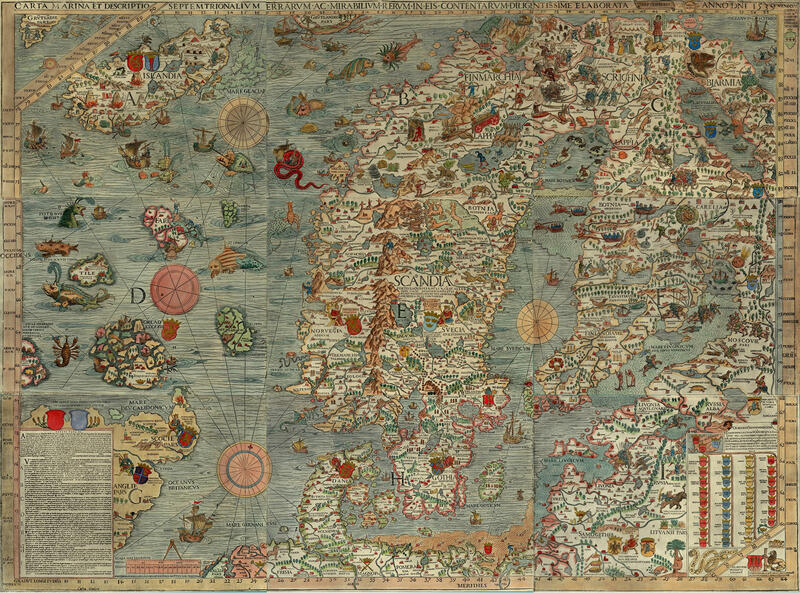 The Carta Marina of 1539 was created in Rome by the Swedish ecclesiastic Olaus Magnus (1490–1557). Click to enlarge and see all the details. “..Thyle, which was distant from Orkney by a voyage of five days and nights, was fruitful and abundant in the lasting yield of its crops”. This means that Solinus can not be referring to Iceland or Greenland where the climate was, and still is, far too harsh to be fruitful (Editor’s note). “…Thule; an island in the Ocean between the northern and western zone, beyond Britain, near Orkney”. Interesting that the second map is quite accurate. Thanks for posting. Modern Thule is in Greenland, is it not? There is no place that actually is named “Thule” in Greenland, except from Thule Air Base, the United States Air Force’s northernmost base, located 1,207 km (750 mi) north of the Arctic Circle on the northwest side of the island of Greenland. Like you, I have always thought that Thule is located “somewhere” in Greenland or Iceland..
mmm – interesting. I guess Smilla’s feeling for snow perpetuated that myth.